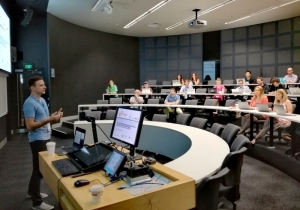 Today, Jan-Niklas and Peter held a pre-conference workshop at this year’s ISRII in Auckland. ISRII is a multidisciplinary conference with focus on internet interventions. The 34 attending participants were introduced to the concept of rule-based conversational agents and were able to design their own tailored interventions using the C4DHI’s Open Source intervention platform MobileCoach. Insightful discussions and creative participant-built interventions have set the tone for a stimulating conference!